Gerani is a small holiday resort on the Chania Coast. 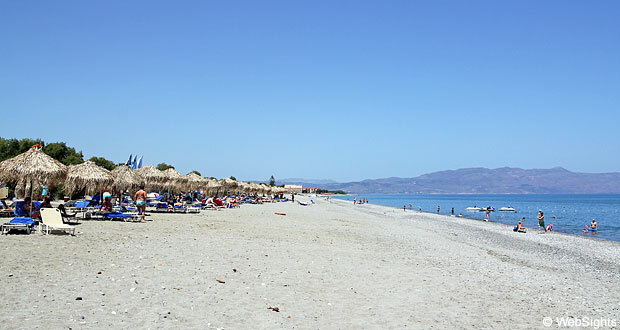 It is located only a few kilometres west of the large holiday resort Platanias, and there are 30 kilometres by car from the international airport in Chania. Gerani has a long and wide beach. From the beach, there is a lovely view of the mountains on both sides and the island Agii Theodori, which is located just off the coast from the holiday resort Agia Marina. Most of the beach is covered by coarse sand, but along the waterline there are pebbles. There are also pebbles a few metres into the clear water and it would be comfortable to wear bathing shoes. The beach has several sections where it is possible to rent sun lounges and sunshades and it also has showers and changing facilities. During the high season, the busiest area of the beach is supervised by a lifeguard. It is possible for children to play and play ball at the large beach. However, the pebbles along the waterline and the relatively deep water make the beach less child-friendly. It is a good idea to let the children wear bathing shoes. 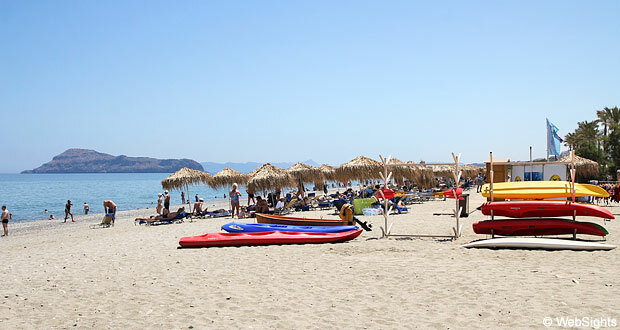 Different types of water sports are offered at the beach in Gerani, including sea kayaks and jet ski. These can be rented at the beach right in front of the large hotels. 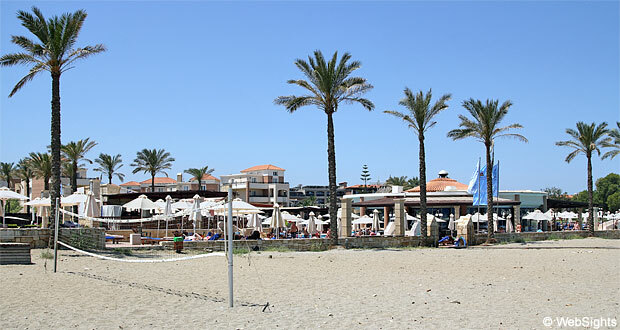 There are a few restaurants at the beach, but most of the visitors live in Gerani and eat at their hotels. Gerani is a small and fairly quiet town. Except for the beach hotels, most of the activity in town is centred round the main road that goes through the town. Here you will find some restaurants, a few tourist shops, a supermarket and even a bakery. There are several small family-owned hotels in Gerani, but also large resorts such as the Blue Village Hotel right next to the beach. 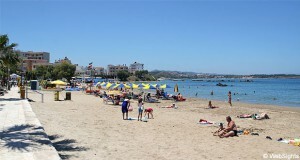 The town also has a regular bus service to Platanias, which has a more varied selection of restaurants and shops. It is also possible to walk the two kilometres along the road or the beach. 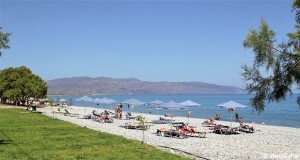 The larger holiday resort, Platanias, is located a bit east of Gerani. A few kilometres to the west, you will find another small holiday resort, Maleme.